Something you see for sale at almost any flea market or tag sale are antique telegraph insulators. These are the heavy glass fittings found at the top of telephone poles, about the size of a softball, that hold and insulate electric wires from the wooden pole. They were manufactured by the hundreds of thousands, most of them are extremely common, so understandably you will see them selling for a buck a piece, which makes it somewhat shocking to find out what their value potential can actually be, if you find the right one. With what seems like a very minor difference in form, embossed lettering or color, that one dollar insulator could be worth hundreds or even thousands of dollars. That large swing in value is generally associated with the insulators rarity. Of all the antiques and collectables I have collected or researched over the years, telegraph insulator collecting is one of the most detail-sensitive fields I have ever encountered. For an advanced insulator collector, finding a historically important, rare and esthetically pleasing specimen can be a lifetime obsession. And for the non-collector who sees them seemingly everywhere at yard sales and thrift shops, the concept of their potential value can be hard to get a grasp on. 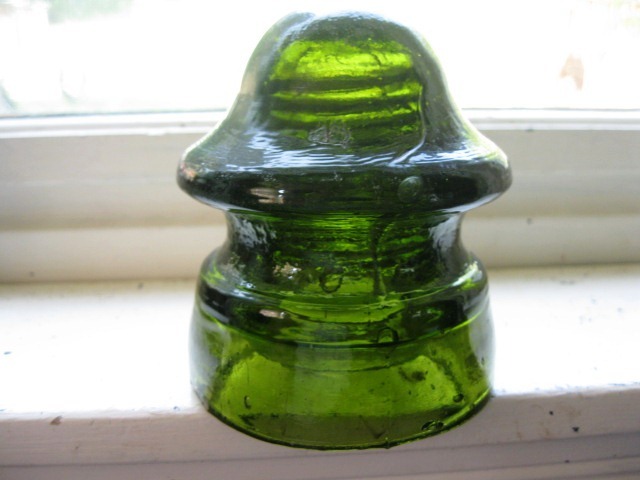 As a bottle digger and collector over the years, I would come across insulators and knew the basics, but didn’t research them fully, and pretty much dismissed them. 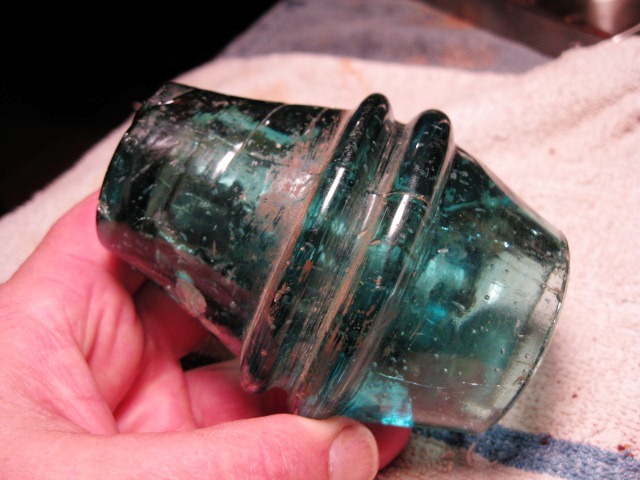 Then by chance, I wound up picking up an insulator at a yard sale, and paid $5 for it, because it just looked different enough to warrant checking into it. To my shock, I sold it at auction for more than $3,000. That was the wake-up call that prompted me to study the subject more fully, and there was plenty to learn. 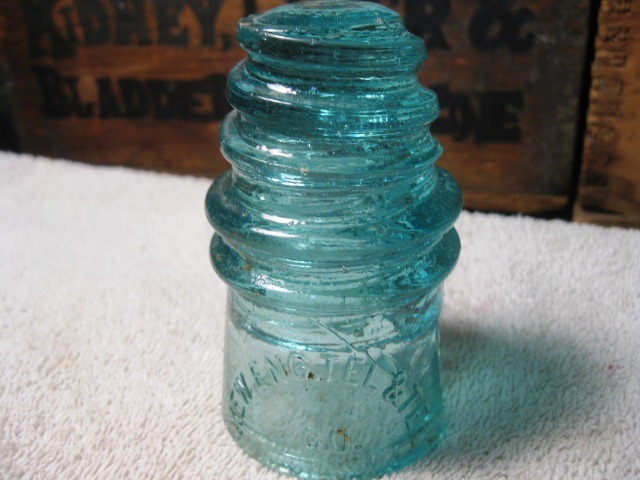 I found that the insulator I had happened upon dated back to the 1870s and was used on one of the first telegraph lines, strung from Halifax, Nova Scotia, to Washington, D.C., running, as most telegraph lines did—alongside a railroad track—which was an ideal place to run lines, where the pathway was already cleared and maintained by the railroad. The way it was described to me by an advance insulator collector, I found it fascinating, and it helped me appreciate why a specific insulator might be so desirable. He told me that during that period in American history, the only way to get “news” from England and Europe over here to the U.S.—and more specifically in this case, to Washington DC—was by ocean steamship. And the ultimate in fastest ways to get a message from this point A to point B was for telegraph operators on board these ships, to be the first people off the ships as they entered Halifax. So they were lowered down into smaller rowboats or dinghies, racing to the docks and then racing down the docks to the nearest telegraph station. I could picture them racing into a little telegraph station, quickly sitting down and tapping out the urgent news from London or Paris. It must have felt magical for them to know that within seconds, their message was being relayed to Washington, D.C., where the president may be sitting at a table, listening as the news is read to him. And while I didn’t quit my job and devote my life to collecting insulators, it was awesome to think that the insulator I had in my hands, carried the wire that held those historically important messages. And because of the research and record keeping of the people involved in this field, it could be proved that my insulator could be traced back to that one important line. Threadless insulators are older and much rarer. They were used before screw threads were patented and used universally, and the insulators were simply tapped on to the tops of pegs on the telegraph poles. These did not work well, as a good wind storm could yank the insulator off the peg. When screw threads were implemented, the threadless ones were replaced, sometimes wacked with a hammer, with the broken pieces falling to the ground at the base of the pole. Other times, much to the appreciation of collectors, they were replaced more gently and discarded in a trash dump, left there to hopefully be recovered a century later, like old bottles and pottery. The other point is less black and white, but still helpful. 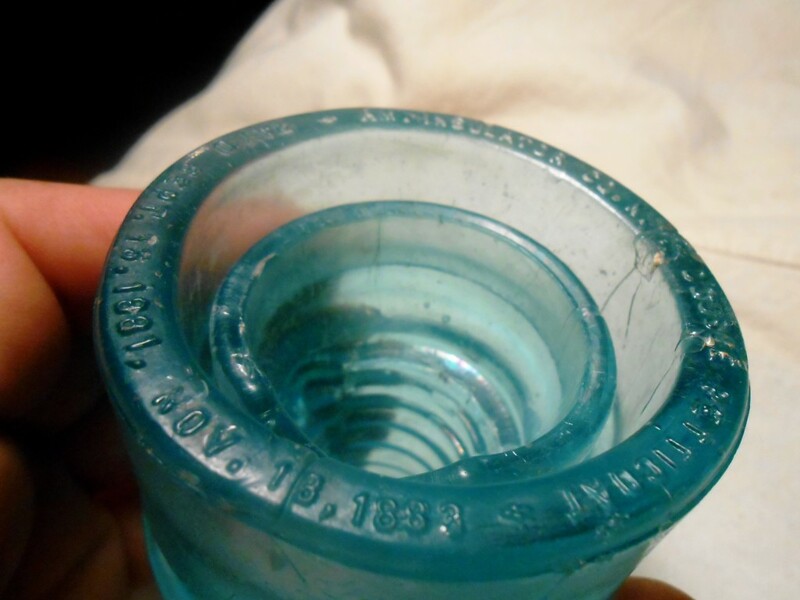 It is that there are three insulator manufacturing companies that dominated the industry, and their embossed lettering appears on the face of these insulators. Those companies are Whitall Tatum, Brookfield and Hemingray. As a general rule, any insulator that has embossing other than these is worth taking a second look at, as it could be rare. Don’t misunderstand—those three companies made variants of insulators, variants in form and color, which can be very, very valuable. But typically, with numbers of their common insulators being sold in box lots out in the market, it is a fair bet—not a sure bet—but a fair bet, that they are the common dollar variety. Insulators are categorized by advanced collectors by a CD number (consolidated design number). 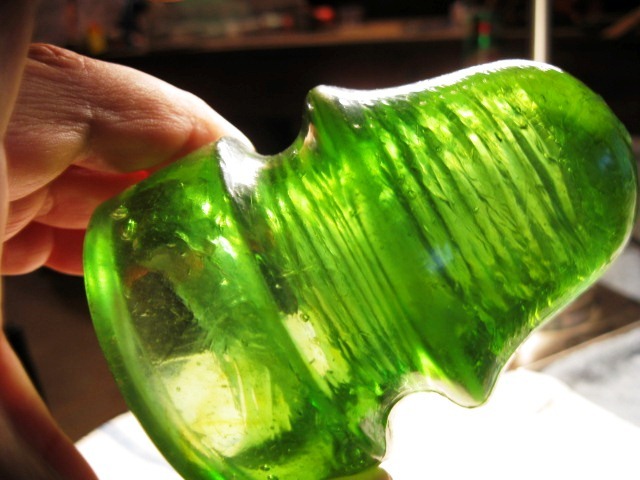 I have always admired the meticulous work and research that insulator collectors put in to their hobby. It is so detailed and accurate that it boggles the mind. And that is in contrast to the randomness by which they were discarded and therefore often found today by construction workers or people digging old trash sites for bottles. And if you find one, it can make for a truly unique and unexpectedly valuable discovery! ← READ MY LIPS… THERE’S TREASURE IN YOUR BACK YARD! Is that a chartreuse NN Pennycuick 134? Cant believe you found an NET&T corkscrew! The other Pennycuick is a chunk of gold too. Incredible.